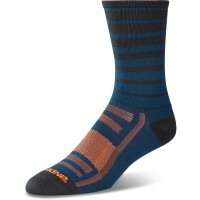 Dakine singletrack Socks Boy by its polypropylene material moisture absorbing and isolate unpleasant odors . The incorporated mesh inserts the air can circulate optimally, resulting in the optimum ventilation of the foot. The reinforced instep Dakine Bike Socks absorbs shocks as possible. Customer evaluation for "Dakine Singletrack Sock Electric Mint Stripe"